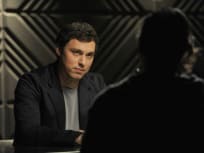 "The Recluse in the Recliner"
When Booth is questioned by a Congressional Subcommittee, he faces unexpected consequences on the season 9 finale of Bones. "The Drama in the Queen"
The body at the bottom of a well turns out to be a college swim coach who may have been having an affair on Bones. A body found in a National Park may be the victim of the Ghost Killer on Bones. "The Cold in the Case"
The body of a woman who was cryogenically frozen is found in a swamp. Meanwhile, Booth is up for a promotion that may require he relocate on Bones. "The High in the Low"
As Booth prepares for his FBI competency test, a body found in the woods is linked to a marijuana dispensary on Bones. "The Turn in the Urn"
When a wealthy collector walks into his own funeral, the Jeffersonian must figure out who is in the urn on Bones. "The Carrot in the Kudzu"
A children's TV icon is murdered but when it's found out that he had several lovers, the suspect list grows on Bones. "The Repo Man in the Septic Tank"
A repo man with a dark past ends up dead in a septic tank on Bones. "The Source in the Sludge"
Freddie Prinze, Jr. returns as CIA Agent Danny Beck who enlists Booth to help him track an Afghani terrorist. "The Heiress in the Hill"
The team tries to determine if a kidnapping victim's death is related to her strained relationship with her mother on Bones. 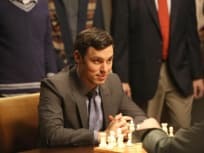 "The Master in the Slop"
Sweets skills as a chess player prove valuable when an investigation delves into the world of professional chess on Bones. A new case leads Booth and Brennan to a bar and a talk with Wendell about his future on Bones. 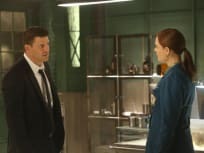 "The Ghost in the Killer"
Booth grows concerned when Brennan is determined to prove that a serial killer is behind their latest case on Bones. 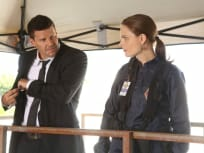 "The Spark in the Park"
Booth and Brennan realize a murdered gymnast was living a double life while Cam confronts the woman who stole her identity on Bones. "The Mystery in the Meat"
Angela throws Brennan an after-the-wedding bachelorette party on Bones. "The Fury in the Jury"
Brennan is on the jury when a professional soccer player is charged with killing his wife on Bones. "The Dude in the Dam"
When a model is found murdered on Bones, the investigation uncovers that his main source of income came from donating his sperm. "The Nazi on the Honeymoon"
Booth and Brennan honeymoon in Buenos Aires but end up investigating a murder when a Nazi war criminal's remains are found in a mass grave on Bones. 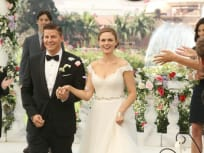 On Bones, Booth and Brennan's wedding day draws near. The team tries to keep murder details from the bride so she can focus on the big day. 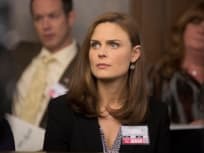 "The Lady on the List"
The investigation into a high school principal's murder uncovers the man's bucket list and Booth and Brennan start planning their wedding on Bones. 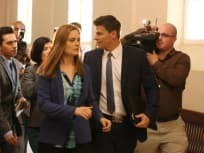 "The Sense in the Sacrifice"
When the team tries to taunt Pelant into showing himself, the plan results in tragic consequences for someone close to Booth on Bones. "El Carnicero en el Coche"
When a gang member turns up dead in a burned out car, Sweets ends up in the middle of the investigation due to his personal relationship with the dead man's son on Bones. "The Cheat in the Retreat"
When bobcat-eaten body is found in a dumpster, Booth and Bones go undercover at a couples retreat as Tony and Roxie on Bones. "The Secrets in the Proposal"
A man's remains are found in an air conditioning unit on the ninth season premiere of Bones. Brennan and Booth's relationship is on shaky ground. [to Bones] I'd die for you. I love you. Permalink: I'd die for you. I love you. [to Caroline] Have you noticed that dead bodies always save Booth from confronting his demons? Bones Season Finale Pics: First Look!